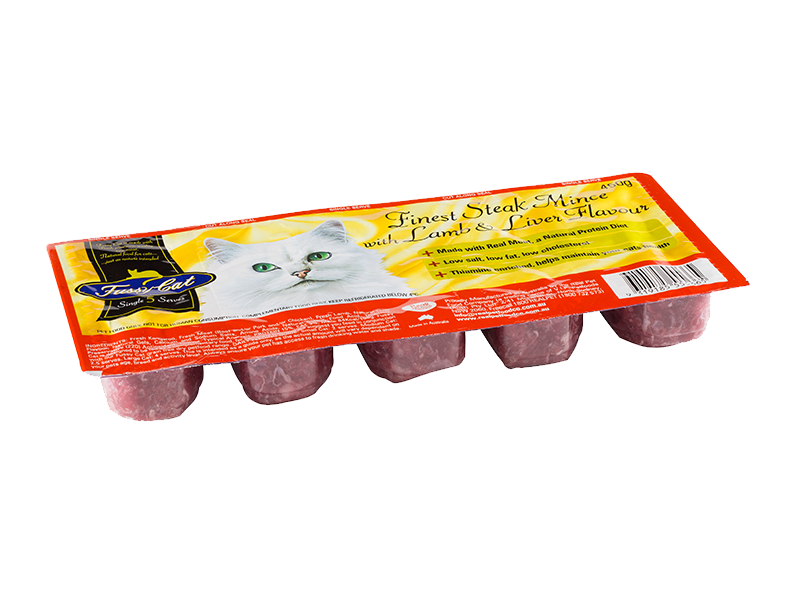 Fussy Cat Finest Steak Mince with Lamb & Liver Flavour is made with real meat. A natural protein diet with low fat, lean meat and taurine enriched that helps maintain your cats health. It is grain free, for easy digestion. Fresh Kangaroo, Fresh Meat (Beef and/or Pork and/or Lamb and/or Chicken), Natural Flavour, Natural Gels, Calcium and Sodium Salts, Amino Acids, Natural Lamb and Liver Flavours, Natural Colour, Food Acid, Thiamine, Preservative (220) Antioxidant, Taurine. Copyright © 2019 Fussy Cat (Aust) pty ltd 2019 | All rights reserved.